Thousands of people have been writing love on their arms yesterday and this weekend in support of To Write Love On Her Arms (TWLOHA). It’s an organization that gives hope to people who struggle with depression, suicide, self-injury and addiction. What’s cool is that none of this was started by TWLOHA. I’m not sure how it all started, but someone launched a TWLOHA Day on Facebook, and pretty soon dozens of similar events were popping up, some with tens of thousands of people participating. I wrote about it for HalogenTV and then put together a photo gallery from some of the thousands of photos people have shared. It’s pretty cool to see people show their support in such a tangible way. 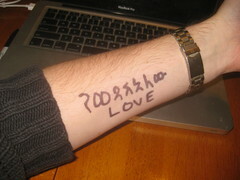 I asked Yeshumnesh how to write ‘love’ in Amharic and to my surprise she only laughed at me a little bit.